In UAE you don’t need to go far offshore, dolphins can sometimes even be seen from the shore! Most of the time whales and dolphins are not seen because people are not aware of their presence and don’t look for them. It is important to remember that the ocean is their domain. Excessive boat traffic and harassment has been proved to have detrimental effects on dolphin and whale populations. In the past decade the number of recreational boats in UAE waters has increased exponentially. It is easy to minimise the disturbance and enjoy the sight of these beautiful creatures by following some simple steps. Be Dolphin SMART code is based on international guidelines. 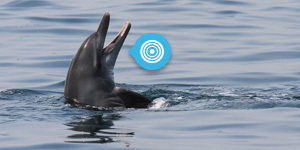 The contents and design have been adopted from the Ionian Dolphin Project (Tethys Research Institute). Illustration by Massimo Demma. Please BE DOLPHIN SMART! REPORT YOUR SIGHTING and demonstrate your support for dolphin conservation. The caution zone for vessels is the area within 150m of a dolphin and 300m of a whale. No more than three vessels should stay within the caution zone at any one time and vessels should move cautiously at no wake speeds within this zone. Watch out for offspring presence! avoid disturbance to mother whales or dolphins and their calves. Mother and calf will be close together and the calves are sometimes difficult to see. If there is a sudden change in whale or dolphin behavior, move away immediately at a slow steady pace. Whales and dolphins sometimes form social groupings and may approach your vessel – if this happens place the engine in neutral and let the animal(s) come to you; or slow down and continue on course; or steer a straight course away from them.